From the shores of Clew Bay to the top of Croagh Patrick, the picturesque 250-year-old heritage town of Westport in County Mayo is a destination that should be on your list. It has so much to offer from mountain walks to Michelin accredited restaurants. It offers family friendly activities to keep the little one’s, and not so little one’s happy, but is also a destination ideal for that special ‘grown-up’ getaway. 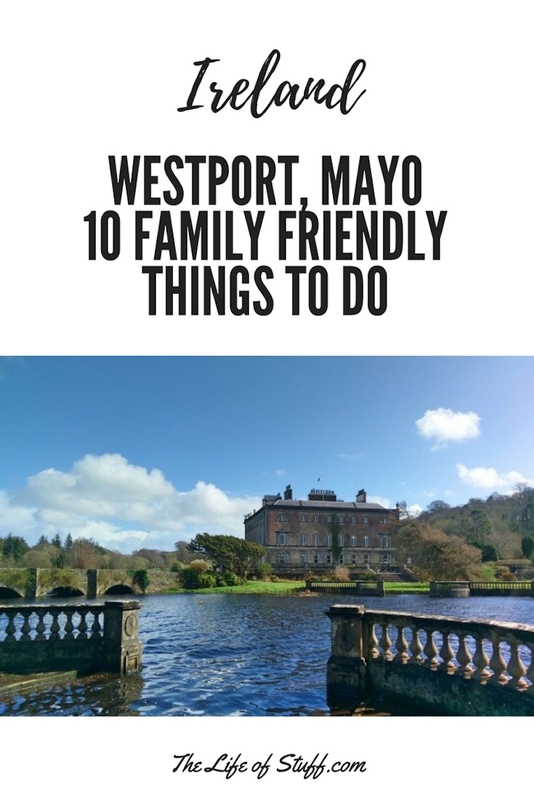 With my own family, and yours in mind, I’ve compiled a list of ’10 Family Friendly Things to Do’ when staying or visiting Westport. The list is in no particular order, and it should suit all tastes. I’ve included links for reference, but please check if booking is required, and confirm opening times to save disappointment. Built on the ruins of one of Pirate Queen Grace O’Malley’s many castles and standing in all its glory thanks to the Browne family, her direct descendents, Westport House is one of Ireland’s top historical and family attractions. It offers visitors the chance to tour a beautiful ancestral home and play in its gardens steeped in history. The Great Western Greenway is the longest off-road walking and cycling trail in Ireland. It stretches 42km and follows the route of the Westport to Achill Railway which closed in 1937. ‘Achill to Mulranny’ route which is 13km. Hundreds of beautiful beaches stretch the length of Mayo County, and a number of them classed as Blue Flag beaches are found close to Westport. When a beach is awarded a Blue Flag it means that not only is it recognised worldwide but its an ideal location for family excursions as it meets a specific set of criteria. This criteria includes water quality, environmental education as well as safety and beach management. Some beaches are perfect for watersports, others for fishing. Most have toilets on site, many are wheelchair accessible. Lifeguards can be found on duty during the summer season at a number of beaches too. It is said that Clew Bay has a total 365 islands, that’s one for each day of the year! Clare Island is the largest of these Islands and is home to approximately 130 people. It’s steeped in history and offers its visitors a blue flag beach which is easy to access from the harbour. Clare Island is reachable via Roonagh Quay and for more info visit clareisland.ie. However Clare Island isn’t the only island worth your visit. There is also Collanmore Island which is reachable by Rosemoney Pier, and of course the famous islands of Inishturk and Achill which can be reached by ferry from Roonagh Quay. “A landscape fossilised,. Its stone wall patternings. Repeated before our eyes. In the stone walls of Mayo.” (Seamus Heaney). At almost 6000 years old, the Céide Fields are the oldest known field systems in the world. This neolithic site of stone-walled fields was first discovered by a local school teacher, Patrick Caulfield, while out cutting turf in the 1930’s, and thanks to him we now have the chance to experience a part of history that was nearly long forgotten. Located about an hours drive from Westport, in Ballycastle, the Céide Fields are worth the scenic drive. Expect a beautiful landscape of wilderness and fauna, spectacular cliffs – there’s a viewing platform positioned on the edge of a 110m high cliff!, and a visitor centre with a 4,000 year old pine tree inside! For more info visit ceidefields.com or the Museums of Mayo website museumsofmayo.com. Killary Harbour is approximately a 40 minute drive from Westport. It’s south of Westport and is known as Ireland’s only Fjord on the Wild Atlantic Way. Stretching 16 kilometres long, the scenery it offers of the surrounding countryside and waters around it is an experience to remember. A break away or holiday isn’t really a break away or a holiday if you haven’t taken a step away from the kitchen and enjoyed your dining out experiences. With a family in tow, these dining out experiences can easily be fulfilled in Westport. From casual eateries to Michelin rated restaurants your taste buds are sure to be tantalised. On a recent visit to Westport, Patrick and I along with our toddler Smith enjoyed a number of delicious dining experiences. Lunch was enjoyed in the relaxed setting of the Michelin rated The Tavern Bar & Restaurant. Dinners were enjoyed both at our hotel’s award-winning restaurant Islands Restaurant in Hotel Westport and at the award-winning, Michelin rated and deservedly renowned Cronin’s Sheeben. With a host of beautiful beaches waiting for your feet to sink into its sands and sprinkle your hair with its salty waters, you could say its a shame to even consider an indoor swimming pool. However when requests are made by your little, or not so little ones, to visit a swimming pool on those not so sunny days Ireland has the pleasure of entertaining, then Westport has your back. You don’t have to spend a fortune on playdates when visiting Westport because there are places your children can play for free. There’s the aforementioned The Great Western Greenway, which is free to walk or cycle. There are the numerous beaches I also mentioned, that are free to swim at and play on. And when those little legs are tired from walking, those bums are sore from cycling and you’re fed up shaking sand out of socks you can plan an alternative playdate at one of the playgrounds. Westport Skate Park which is, funnily enough, right beside the Westport Greenway at the junction of West and Leenane roads is an ideal spot for children of all ages. The park has a purpose-built skateboarding and rollerblading area, an astroturf pitch and a playground. Westport is celebrating its 250th Birthday this year, 2017 so its well worth checking out the many festivals and events that are planned. Thank you to Suzanne O’Brien of the award-winning, family friendly Hotel Westport for organising our two night stay earlier this year. We enjoyed it and hope to return to stay for longer, and explore all that’s on offer.